You've got your KISS ketchup, action figures, toothbrushes, underwear, air fresheners, condoms, credit cards. And perhaps you've already purchased a KISS Kasket. But if you were hoping to sit back with your little ones and watch a KISS TV show the whole family can enjoy, well, you're in luck, because that's just what's being planned. 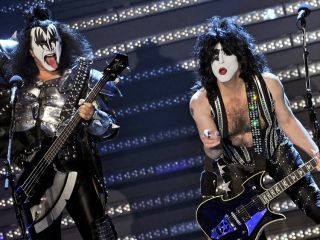 Honestly, the idea of a children's show that features a bass player dressed up in leather who spits fire and sticks out his blood-covered tongue might strike some as, uh, strange, but founding KISS members Gene Simmons and Paul Stanley think it's the logical next step for a new generation of KISS Army inductees. The untitled comedy series will be produced and distributed worldwide by E1, which along with Simmons and Stanley will handle all licensing and merchandising for the half hour. "Kiss continues to be the juggernaut of licensing and merchandising, from Kiss M&M's to Kiss Dr Pepper," Simmons said in a statement. "Kiss is a band, but also the only music brand. Continuing in our 35 year history of going where no band has gone before, we are proud to partner with E1. Like all things KISS, we intend to make this a very special show for our fans." No word was given what roles original members Ace Frehley and Peter Criss would have in the show, but we imagine their likenesses will be used in some fashion.